You need new ideas for snacks, don’t you? That seems to be what I get asked about most often. Try some high-protein Crispy Roasted Chickpeas flavored with Parmesan cheese, garlic, oregano, and hints of lemon. I’ve been in a snack rut. I love fruit, string cheese, Buffalo Wing Hummus with celery sticks, plain Greek yogurt with fresh berries, and homemade gorp made with nuts, seeds, and dark chocolate, but I wanted something different. I tried to think of foods that were relatively high in both protein and fiber and settled on chickpeas. Then I remembered a recipe I tried years ago for roasted chickpeas. It wasn’t very good. The chickpeas were mushy and the spices burned. The chickpeas need to be as dry as possible before roasting. Seasonings should not be added until after roasting. Don’t like the Parmesan-garlic-oregano-lemon spice combo? See other ideas at The Kitchn or try your own blend instead. Pat chickpeas dry on all sides with paper towels. Spread out on a clean thin (not fuzzy) dish towel and let them air-dry while the oven preheats. Discard any skins that come off. Place chickpeas in a medium bowl, then drizzle with olive oil and sprinkle with 1/4 teaspoon kosher salt. Mix gently with a wooden spoon. Pour chickpeas onto a baking sheet and spread out in a single layer. Roast for 10 minutes, stir, then roast for another 10 minutes or until chickpeas are golden brown. In a small bowl, combine cheese, lemon zest, garlic powder, oregano, salt, black pepper, and cayenne. Pour chickpeas into a clean bowl and add the cheese mixture. Toss well. Serve immediately or spread out on parchment paper, let cool, and store in an airtight container. The chickpeas will be the most crispy when they are warm. After they cool, they will be more chewy. 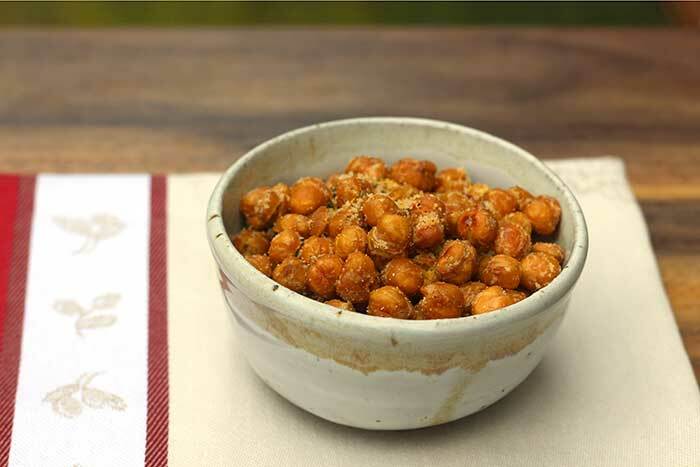 Try these roasted chickpeas as a snack or a substitute for croutons. Don't like this spice combination? Feel free to create your own custom blend. Isadora – Thanks! Let me know if he tries (and likes) them. This is the best website I’ve found! Thank you so much!